LANGUAGES ARE self-evolving systems, so we do not know what shape they will take in the future. What we do know is that we would not be talking in as many tongues as today. 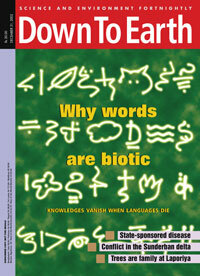 The rate of language extinction is much faster than that of species extinction. The most widely shared estimate is that by the end of this century, half of the current 7,000-odd languages will die. A more dire estimate says we will lose 90 per cent of the languages by then. This is humanity fast losing its memory and ingenuity. Indigenous communities across the world have a detailed knowledge of their environments, which is embedded in their languages. Scientists are still learning to benefit from that. Documented scientific knowledge is only a fraction of what oral traditions carry. Some of the common medicines like aspirin and quinine owe their discoveries to traditional knowledge. Ethnobiologist Darrell Posey had once noted that pharmaceutical companies made a profit of US $85 billion a year on medicines derived from plants first identified by indigenous people for their healing properties. Yet commercially exploitable knowledge does not capture the full worth of a language. Every language represents an alternative culture, a different way of seeing the world and relating to it. This diversity provides resilience to the human race. Today, in a few of the cases where the dominant culture is failing, it is forced to borrow from these alternatives: personhood to save rivers, for instance. It is also evident that very little borrowing is happening and much is lost in translation. In the next 25 years we would be poorer by a few hundred languages. These language communities, mostly indigenous peoples, would have been wiped out or assimilated, as is happening all around. Even if small languages survive, without biodiversity, their richness would not. This is what increasing urbanisation would do. As cities gobble up villages, ponds, grasslands, wetlands and forests, vocabulary describing their plants and animals would diminish. When landscapes become monotonous, so does language. Besides dominating cultures and urbanisation, languages in the coming years will face another big hurdle: the digital divide. Africa has the highest diversity of languages; some 2,000 tongues are spoken on this continent. Google Translate supports a little over a dozen of them. 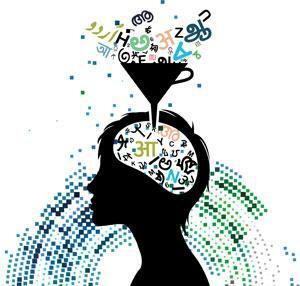 India, another language hot spot, has 780-850 languages, according to the People’s Linguistic Survey of India conducted under the direction of self-trained linguist G N Devy. Google supports a little less than a dozen of them. Compare this with over 30 languages that Google recognises from Europe, described as a linguistic desert. The digital realm would not just perpetuate but accentuate the linguistic unevenness of the analogue world. Mathematical linguist András Kornai estimates that no more than 5 per cent of the living languages will cross over to the digital world. With the UN declaring access to the Internet a human right, digital communication is only going to grow. Inability to use this space would be an additional setback for endangered languages. Several linguists and community members are using these very digital tools to rekindle the interest of communities in their mother tongue. Chickasaw, an indigenous community in the US, leveraged social media to spark interest among youngsters in learning their ancestral language, which was on the verge of extinction. It also has an app for learning the Chickasaw language. Descendants of hunter-gatherers in Nunavat in Canada navigate the web in Inuktitut, an endangered language. Speakers of a few other endangered languages are successfully using digital platforms with active support from Facebook, Google and Microsoft. But Kornai is of the view that these efforts would not make any significant difference. Devy thinks the digital age poses a more fundamental threat to natural languages through artificial intelligence that mixes past, present and future. “Humans today no longer want to remember. Everything is outsourced to an artificial memory chip,” he was quoted as saying in Open. “We will start thinking like a machine, and move towards image-based communication. That is why languages are dying rapidly around us. Humans want to move outside of language, to another phase of evolution that will allow us to think of multiple times and spaces at the same time.” This, if it happens, won’t be in the next 25 years. What is plausible in the coming quarter of a century is a more bilingual world using the digital space in more radical ways. One way could be many internets. As linguist and writer Ross Perlin puts it, “There is no reason we cannot have both a single Internet and a fantastic diversity of smaller internets (or even intranets), communities of users with their own digital turf in the form of domains, closely linked websites and specialized tools and services.” Google Translate can act as a bridge between these internets. Ultimately, only those languages will survive whose speakers take pride in them. “When metaphors die, ideas pass away and a way of thinking is buried,” says Sakar Khan. He is not a linguist. He is a musician. He plays the khamaicha—a four-string instrument. Somewhere in his eighties, he is arguably the most revered of the musicians in his tribe—the langas of Rajasthan. Reticently he shares his feelings, “I see today’s generation ignore the khamaicha. I can’t help it. Music, like language, can provide only a metaphor for a way of life. When people lose a way of life, their language struggles to survive.” In a similar vein, linguists remember Tefvik Esenc, the last speaker of Ubykh, a language once spoken in north-western Caucasus. Some years ago they scampered to his village of Haci Osman in Turkey to meet him. He had three sons, all of them unable to understand his tongue, preferring Turkish instead. He had decided upon his epitaph. “This is the grave of Tefvik Esenc.